Finally, finally, I got around to watching Cranford. This delightful mini-series is based on the novels of 19th century writer Elizabeth Gaskell. The mini-series was filmed in 2007 and shown on Masterpiece Theater in 2009-2010. In the small village of Cranford, times are changing. The railroad is getting nearer and wants to expand into Cranford itself. Most of the residents are against the very idea, not only because the work of building the railroad will spoil their beautiful rustic way of life, but also because, well, just what sort of people might the railroad bring? You never can be too careful, you know, and we don't want any of that outside riff-raff invading our town! ﻿ Leading the anti-railroad charge is Miss Deborah Jenkyns. Strong-willed (she brooks no arguments) Miss Deborah lives with her sister Miss Matty in the middle of town. Their friends are mostly other spinsters of a certain age, who love nothing better than a good gossip. Imelda Staunton steals the show as the busybody Miss Pole, forever nearly injuring herself as she rushes around to all her friends with the latest morsel of overheard news. On the edge of town is the stately home owned by Lady Ludlow. She has only one child living, the spoiled and overindulged Septimus, who is currently residing in Rome "for his health." Septimus seems to have no contact with his mother, other than to write asking for more money. Even though the estate is not bringing in enough to cover expenses, Lady Ludlow refuses to take no for an answer when her son asks for ever increasing amounts of cash. Her estate manager, Mr. Carter (the delightful Philip Glenister playing nice for a change!) attempts to reason with her, to no avail. The railroad is desperate to have some of Lady Ludow's land, and her cash flow problem makes the situation even more precarious. There are plenty of side stories, including the Jenkyns sisters' maid's secret romance with the town carpenter, a young doctor's romance with a local girl that is nearly undone by frequent misunderstandings, and a cow in pajamas after an unfortunate encounter with a lime pit. There is also a poor family whose young son is mostly responsible for the upkeep of his family, with much help from the kindly Mr. Carter. The cast is outstanding, including Judi Dench, Julia Sawalha, Julia McKenzie, Francesca Annis, and plenty of other familiar faces for fans of British TV! The scenery is beautiful and the costumes are lovely. 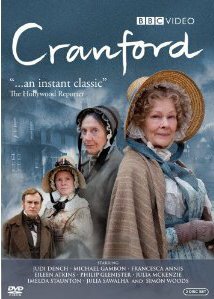 Unfortunately, the sequel, 2009's Return to Cranford, was a bit of a letdown. Most of the familiar characters were back, but the story lines were silly and contrived. True fans will want to catch the second series, just to return to familiar characters and places, but really, you'd be better off to stop after the first!